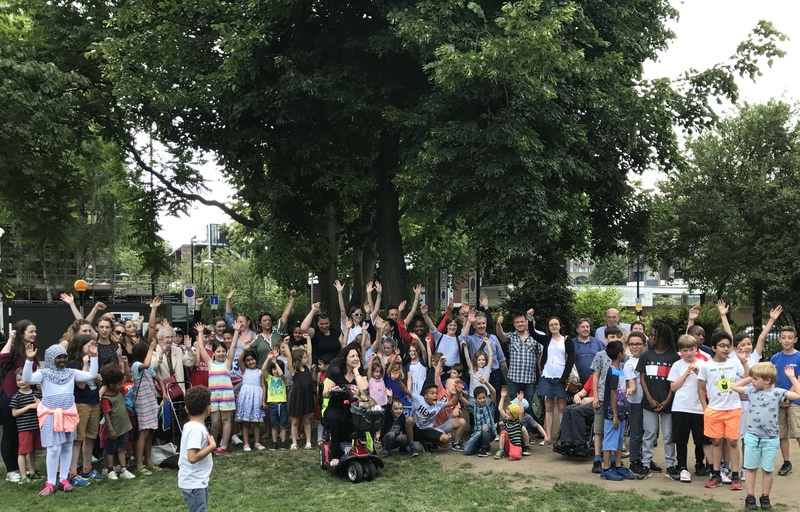 Save Golden Lane Consortium is an affiliated group of local community associations representing the people, who live, work, go to school and use the park in the Golden Lane area. 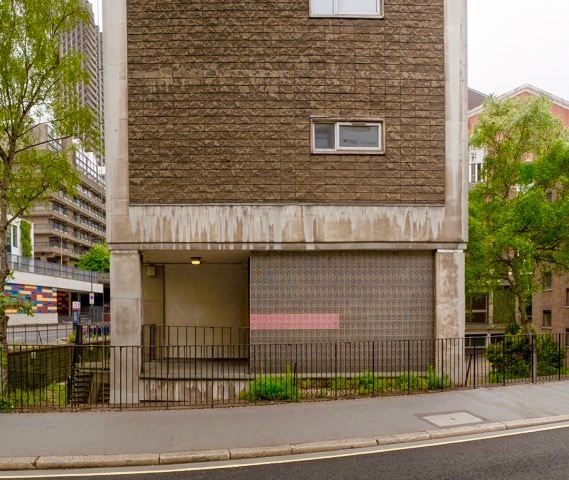 On the 23 May 2017 the City of London Planning and Transportation Committee voted to Approve a planning application submitted by Taylor Wimpey to demolish Bernard Morgan House and to build a block of 99 luxury apartments. The vote was very close, 13 - 10 to Approve. This is a monstrous decision which will have a devastating impact on our community. The destruction of a heritage asset, which housed key-workers for 60 years, replaced with a towering development of private flats containing no affordable homes. It will blight our Grade II listed social housing estate, steal sunlight from our homes and from Prior Weston Primary School, the Jewin Welsh Church and Fortune Street park. We urgently need to raise funds to pay for an independent sunlight/overshadowing report and to obtain specialist legal advice on the prospects of an application to the Planning Court for permission to judicially review the City's decision. We want the decision overturned and the future of the site to be reconsidered with proper regard to the community's views and needs. Sixty years ago the City Corporation's and Islington’s town planners together created a thriving community, their municipal dream of an urban village has been an extraordinary success and should be celebrated and enhanced. Today, City Corporation's planners have shown that they don’t value the visionary town planning of the past and are not interested in protecting the people living in this unique and close community. The centre of this community is the Fortune Street Park, surrounded by the Peabody Buildings, the Golden Lane Estate and the Barbican. A small oasis within the City. 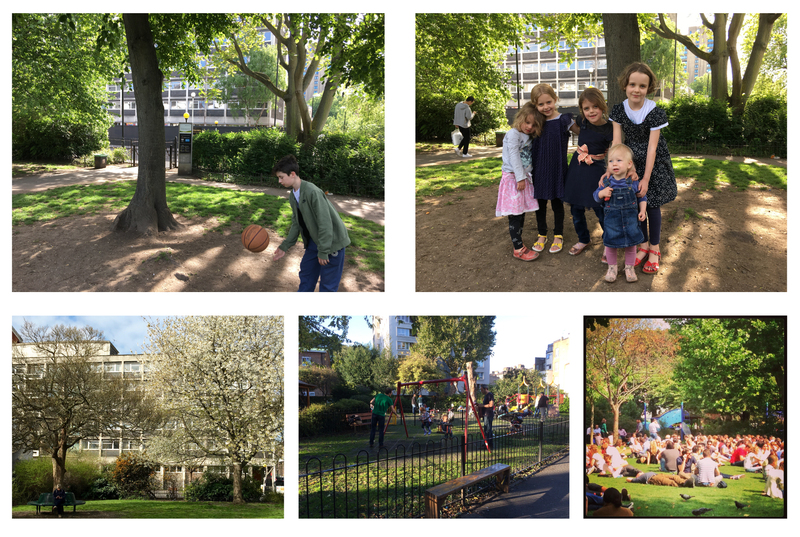 The park plays a crucial part in our lives, it is our children’s back garden, and is shared every day by the thousands of people who live and work here. It is the only public park in the area. Prior Weston School has its entrance in the park, over five hundred children use this entrance everyday. People walk to school here. They’re not jumping into cars to go home. They will stay and play for as long as the sun is out. Because we live in small flats with no outside space, parents don’t rush home. Children play, surrounded by neighbours of all ages, they learn to share and play together. This is why the children growing up here have an extraordinary sense of independence, empathy and responsibility towards each other. At the moment everyone can enjoy the last of the winter sun as it disappears behind Bernard Morgan House. The proposed building is so much higher that from September to March it will block the sun at this crucial time and deny children the warmth of the winter sun at the end of a school day. The proposed development is Taylor Wimpey's generic design. Out of scale and completely at odds with the visionary architecture of the area. it will completely engulf and obstruct sunlight to the Jewin Welsh Church, a heritage asset, which also accommodates the Hatching Dragons Nursery School. It will also obstruct sunlight to the outdoor learning and play areas of the Prior Weston school. Bernard Morgan House is light and elegant, carefully designed to complement the Grade II listed Golden Lane Estate. The new block will loom over the the Golden Lane Estate maisonettes, famous for their light and sense of space. Residents will be overshadowed and lose their privacy and will have to keep their blinds closed. Did Chamberlin, Powell and Bon ever imagine that their carefully designed bright maisonettes would end up dark, dingy and claustrophobic? There were 182 objections from local people to the planning application. City Corporation's planners have interpreted regulations in favour of Taylor Wimpey but ignored all these objections. They say that the harm that the development will cause is outweighed by the public benefits without explaining what those benefits are. Ten Committee members spoke against the plan, clearly stating that the proposed development broke too many guidelines in the Local Plan to be Approved. Only four members spoke in favour but their main argument to Approve was that something had to be built on the site and the developer had to make its profit. Most of the 13 Members who voted to Approve don't live in the City and many of them never inspected the site. These are some of our stories about living in this community. Deborah - I came to Golden Lane Estate as a qualified nurse trained at St Bartholomew's Hospital. My neighbours were fellow nurses, police officers and other key workers who worked locally. This local workforce proved invaluable during the IRA and 7/7 bombings. As I go about the GLE today, I see, meet and greet fellow key workers (we are fewer in number now) including my old nurse tutors. People who have contributed to the functioning health, well being, safe guarding and education in the City all their lives. Claudia - I have three young children close together in age, and living on the Golden Lane Estate has been a lifeline for us. My in-laws live in the block opposite, my sister-in-law in the block adjacent. My girls feel safe, happy and at home here and the sense of community is phenomenal. The Estate provides them with space, light and amenity to give them the best childhood we could want for them. Emma - A year ago my 12 year old son started having epileptic seizures. The friends he grew up with have shown the most extraordinary sense of empathy and social responsibility. They pick him up in the mornings to walk to school and they always make sure there is someone there to walk him home. They look after him and keep him safe. They grew up playing in Fortune Street Park after school everyday of the year. They grew up understanding what a supportive community really means. 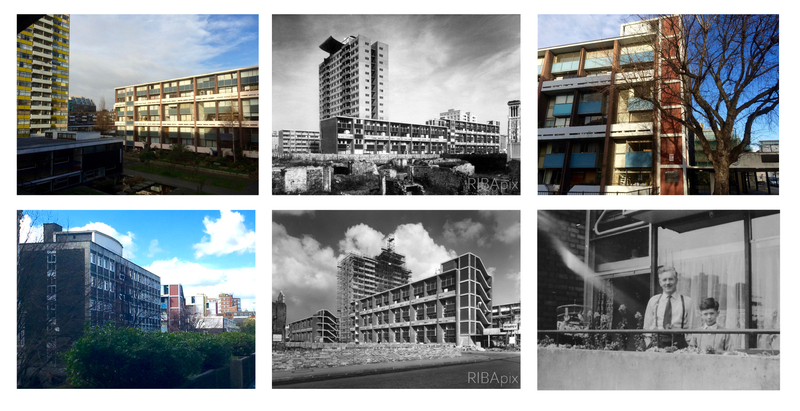 The rapacious onslaught on our beautiful modernist heritage and communities must be stopped. 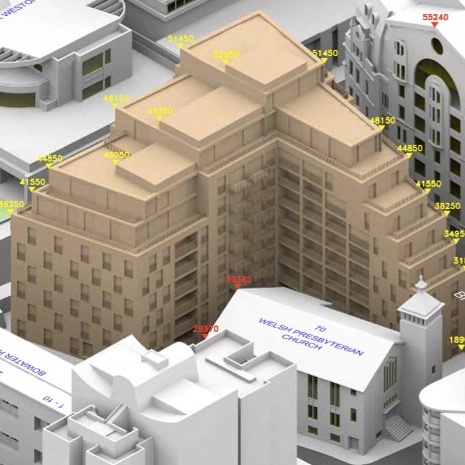 OPEN (Golden Lane)’s application to the High Court, for a judicial review of the City’s grant of planning permission to Taylor Wimpey to build The Denizen, will not be proceeding any further. We have received further legal advice, including a second opinion from an independent and highly experienced specialist QC, that the strengths of the legal claim are outweighed by the increased public expense, the real risk of losing the claim and being liable for potentially substantial legal costs. We have very reluctantly accepted that advice and, to avoid further expense, reached an agreement with the City and Taylor Wimpey to discontinue our claim without any payment of costs. We have got this far by generous public donations. Even if we were to convince a Court at this stage that our claims are at least arguable, the further public donations which would be needed to proceed to a full trial would be put at risk. The legal advice which we have received is based solely upon analysis of the processes adopted by the City when granting the planning permission. It has nothing to do with the merit or quality of Taylor Wimpey’s dreadful scheme because, however bad it is, the Court has no power to intervene on that ground. Planning Committees have a very wide discretion when granting planning permission and they are, in summary, “entitled to foul it up provided they do so properly” as they have done here. We are deeply unhappy to have had to discontinue our claim. Nevertheless our campaign has successes to celebrate. We will continue to campaign against those who promote and allow schemes like the Denizen which damage homes and families, which damage the natural and historic environment and which fail to provide the benefits which the public need and are entitled to. We have had another amazing response from everyone who supports our campaign. Without your generosity we could not have come so far. Thank you so much to everyone who has donated. 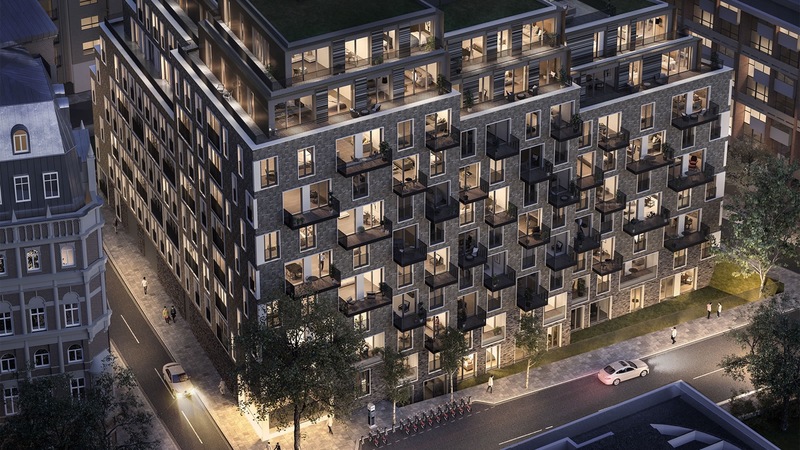 Local people in the Golden Lane community are fighting this development. On Friday we were notified by the Courts that they can allocate enough time on the 1st March for our hearing to make our case for a Judicial Review to a Judge in open court. So Taylor Wimpey’s solicitors, Dentons, have withdrawn their application for an adjournment and the hearing should be going ahead as originally planned on 1st March. Both TW and the City have chosen to send representatives so this is a three way battle. The Corporation of London and Taylor Wimpey against OPEN (Golden Lane). Last week the Mirror On-LIne published a piece which highlighted the lack of concern Taylor Wimpey has shown towards this community. The appalling lack of care taken to protect local children from the dangers of demolition toxic dust inhalation. And sadly the City could do nothing. This is an example of how TW has treated this community from the beginning. Last summer the Save Golden Lane Consortium formed the company OPEN (Golden Lane) Ltd which stands for Organisation for Promotion of Environmental Needs (Golden Lane). The directors of the company are two local mothers who wanted to help the local community fight environmental and social injustice. The members of OPEN (Golden Lane) include the Chairs of the Golden Lane Residents Association and the Bernard Morgan Liaison Group. We are not a big corporation with billions of pounds behind us. Just a group of local people who wanted to protect our community from the rampant greed of developers and this luxury block of flats which will overshadow our local park, school and homes. A luxury development which replaces police accommodation. A development which contains no social or affordable housing. The proposed building, the Denizen will overshadow our park, school and homes. We are not against developments if they are designed to complement existing homes and provide decent social housing to benefit the whole community. 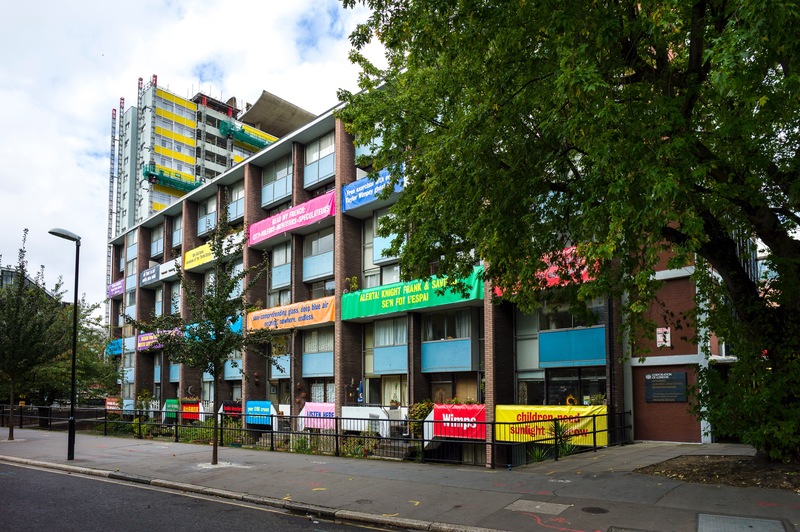 Bowater House residents hung banners from their balconies last year during the Spectres of Modernism protest against the Denizen. We’ve had to rely on the generosity of people who care about communities and believe local people’s needs should not be ignored in local planning decisions. The financial support from the public has been phenomenal. Please come and support us in person at the Public Hearing on Thursday. The hearing will take place in public at the Royal Courts of Justice in the Strand WC2A 2LL. We will be notified of the time and court room number the day before. This case has wide implications for other developments across the whole of London and the UK. If you have already donated please share the Crowd Justice link with at least 5 or your friends, it also really helps to post on social media pages. We still need to raise more money, this is a long and expensive battle. With your support we can get justice for our community and others across London. Many thanks to everyone who has donated and continues to donate to support this campaign. For 55 years the City of London provided accommodation for Police Officers. Not any more. Now only an empty plot ready for property speculators to build unneeded luxury apartments. This has already been a long expensive legal battle and we now need more funds to enable our barrister to present our case at the forthcoming Court hearing where we are seeking permission to pursue our judicial review. The Court hearing was due to take place on 1st March, but Taylor Wimpey and the City have asked for more time than is available on that day, so we are waiting to hear if another date will be set. Since we started the Crowd Justice page last year people have been extraordinarily generous. 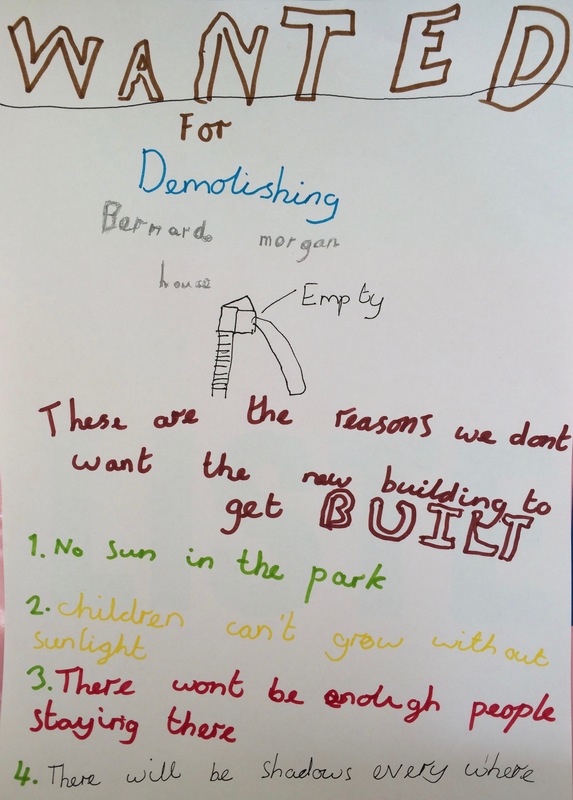 We have used the money raised to challenge the City’s grant of planning permission to Taylor Wimpey which is to redevelop Bernard Morgan Police Section House in a way which causes damage to our local homes, our school and our park, which fails to provide for adequate affordable housing and which damages our local architectural heritage. All our objections are based on official planning policies and all have been overridden in favour of the developer, Taylor Wimpey. The harm Taylor Wimpey's 'Denizen' will do can be seen in this picture. Funds raised have paid for independent expert analysis of Taylor Wimpey’s overshadowing report which has revealed some extraordinary inaccuracies. We have paid for our legal team to obtain and scrutinise all the documents relating to the sale of Bernard Morgan House to Taylor Wimpey and its planning application; to write the required pre-action protocol letter to the City of London setting out our concerns; to responding to the City and Taylor Wimpey’s replies; to preparing and issuing the Court claim for judicial review claim with all the supporting documents; to adding to the claim when the errors in Taylor Wimpey’s overshadowing report were revealed and to applying for a Court hearing of the issues. There are complicated legal arguments which the City and Taylor Wimpey have been fighting us tooth and nail all along the way. The legal process is long and complex but we must continue with our campaign. We believe we have an arguable case which should be heard in public. A national housing charity has recently written to the Court asking to join the claim if we are given permission at the Court hearing to pursue our claim regarding developers’ obligations to provide for affordable housing. We rely on the generosity of people in our community as well as people in the wider community who believe that the public need to be listened to and that public assets should be used for public benefit, and not for private commercial exploitation. We don't need any more luxury homes - there are hundreds left empty and unsold in the area. We want a new development built on this site which has some public benefit, not just public detriment. We now have the Court date for our application for judicial review. The Court hearing is on 1st March at the Royal Courts of Justice in the Strand WC2A 2LL. The hearing is in public and we will be able to publish the time and the court room number the day before. Our claim is a challenge to the loss of sunlight to our local school and park’s open spaces and to our homes, the lack of on-site affordable housing and the financial contribution to off-site affordable housing being less than 50% of the City’s policy requirement and the damage which this gross overdevelopment will cause to a unique area of post-war heritage architecture. Our claim will be argued by our very experienced and specialist barrister, Matthew Horton QC, who has the reputation as a “Brilliant heavyweight advocate, who has a great presence and thinks outside the box"
However we can’t win this case without money! Please help by donating towards our legal costs. This claim is not only about the damage to our local community but has far reaching importance – which is why a national charity has written to the Court to say it wishes to join the claim if we are successful at the 1st March Court hearing. A win will be a blow against property speculation and Londoners being priced out - we need social rented accommodation for people not luxury investment apartments left empty. It will be a blow against those seeking to damage our architectural heritage and steal our sunlight by overdevelopment. It will be a blow against corporate governments which seek to exploit community assets for their own benefit. For far too long the Corporation of London has ignored the community's views and needs in preference to the views of developers. This has to change. If we win this battle there will be far reaching consequences for other developments. Please help support this campaign and put a stop to communities being ignored and the development of more unnecessary overdeveloped luxury investment properties. We need affordable homes here not cash boxes in the sky. Thank you so much for all the support and donations so far. We knew that this would be a long and expensive battle and, sadly, it is still going on. On 24 January we received the Order made by the Honourable Mr Justice Supperstone on our application for a judicial review of the City’s grant of planning permission to Taylor Wimpey. Whatever they think of approved developments, Judges can only intervene on procedural grounds. The Judge, after reading the Court papers, found no fault with the planning process and that the City was entitled to rely on its independent experts’ advice, that the damage to our local heritage and environment and the inadequacy of affordable housing is acceptable. Nevertheless the Judge did not find that our arguments were totally without merit and so we have applied for a hearing to make our case to a Judge in open court. That is why we need to raise more money. Taylor Wimpey have nearly finished the wasteful demolition of Bernard Morgan House, this site needs to be developed in a way that would benefit the community and the environment. 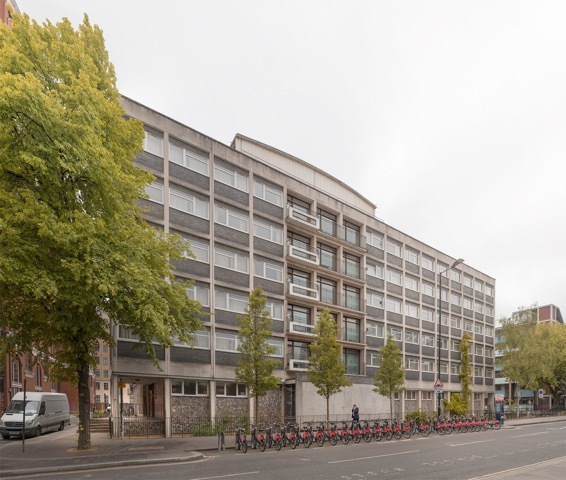 An imaginative design that complements the surrounding listed architecture of the Golden Lane Estate and the Barbican and does not block the light and sunlight on Fortune Street Park, Prior Weston School, and neighbouring residential properties. It’s not impossible. Our battle concerns issues of far reaching importance. It has had local and national press coverage. A national charity has now said it wants to join our fight. A win for us will not only mean a local development which will have more community benefit. It will also have a wider impact. It will be a blow against property speculation and Londoners being priced out - we need affordable homes for people not luxury investment apartments left empty. It will be a blow against those seeking to damage our architectural heritage and steal our sunlight by overdevelopment. It will be a blow against corporate government which seeks to exploit community assets for its own benefit. With your continued help all of these outcomes are possible. Please continue your support and financial help. Many thanks for everyone's support so far. 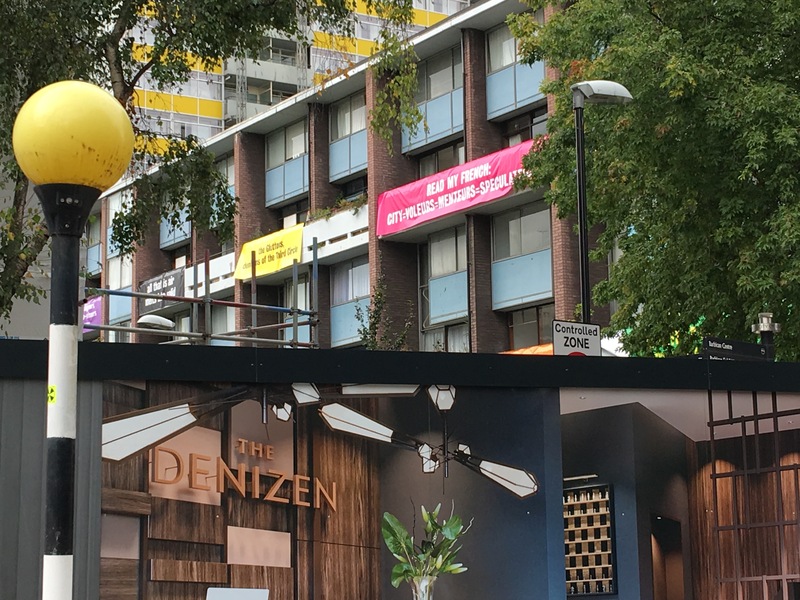 The City solicitors have now confirmed that it will not concede to nullifying the planning permission for The Denizen and that it will be defending its planning decision to allow Taylor Wimpey’s scheme to demolish and redevelop Bernard Morgan House. The City has recently discharged nearly all the planning conditions which prevented demolition proceeding. 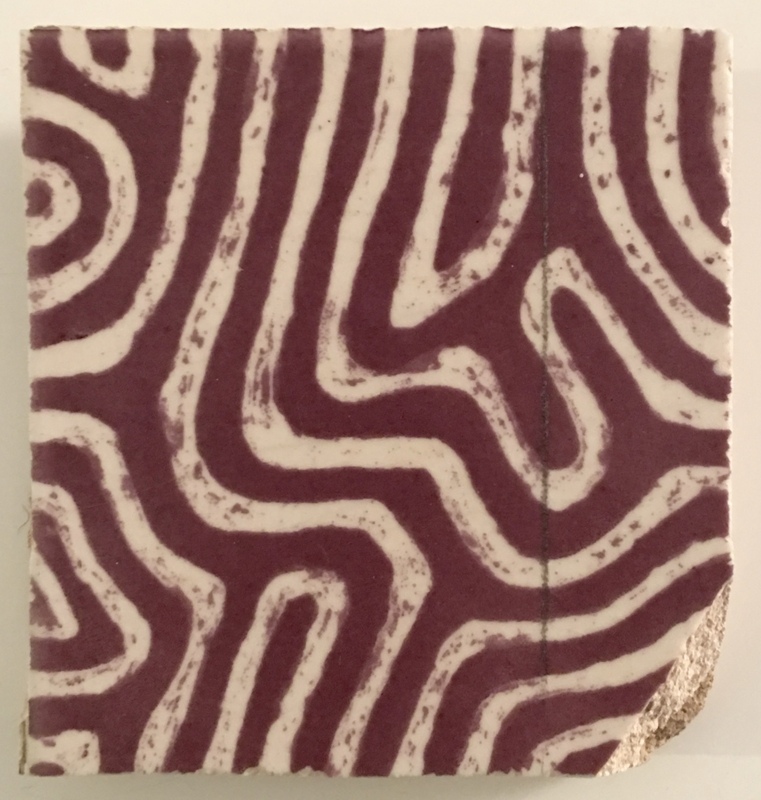 Sadly, after nearly two years TW have now said they may not be able to rescue and reuse the famous decorative tiles, this was one of the conditions. We now have to fight to get permission to proceed with our Judicial Review and to get the planning permission quashed. We have a long and expensive fight ahead and need all the financial support we can raise. Please support the Crowd Justice Campaign and help protect the community from this light blocking unnecessary luxury development. Please can you also help by sharing this page with your friends. You could send this link to five friends who you think might want to contribute and if you use social media please can you post this link on Facebook asking friends to donate. You can also Tweet in support. I hope that we are able, with your support, to make councils and developers realise that all London's communities need to be protected from the overdevelopment of unneeded luxury apartments. That we need more social housing and not ghost homes. We thank you again for all your generous support. Please continue to let everyone know that we depend on public donations to continue our campaign. We’ve now lodged all the necessary papers with the Planning Court and are waiting for the City and Taylor Wimpey to reply before the court makes a decision whether the Judicial Review can proceed or not. The planners should not have agreed to Taylor Wimpey paying only £4.5million towards off-site “affordable” homes which is less than half what the City’s published housing policy requires. We say if Taylor Wimpey ignored those planning requirements, and paid the City too much for the site, then that’s their risk and the community should not lose out on affordable homes. 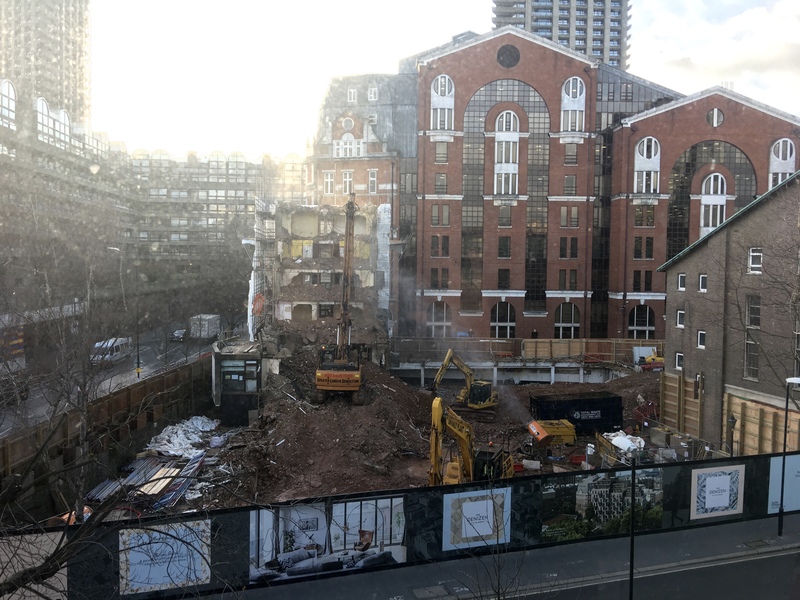 The planners failed to properly assess the damage which The Denizen will cause to the heritage of the area, particularly the Grade II listed buildings and landscape of the Golden Lane Estate and to the Grade II Cripplegate Institute and the Jewin Welsh Church. The planners completely ignored its policy regarding minimizing CO2 emission and climate change when it considered The Denizen’s overshadowing effect on local homes. The Golden Lane homes were designed to benefit from solar energy but some homes will lose up to 62% of their winter sunlight and will have to burn additional energy for heating and lighting. The planners failed to provide us with accurate information about Taylor Wimpey’s overshadowing calculations before the planning committee meeting. We later received clarification, and an apology, and have commissioned a second independent report. 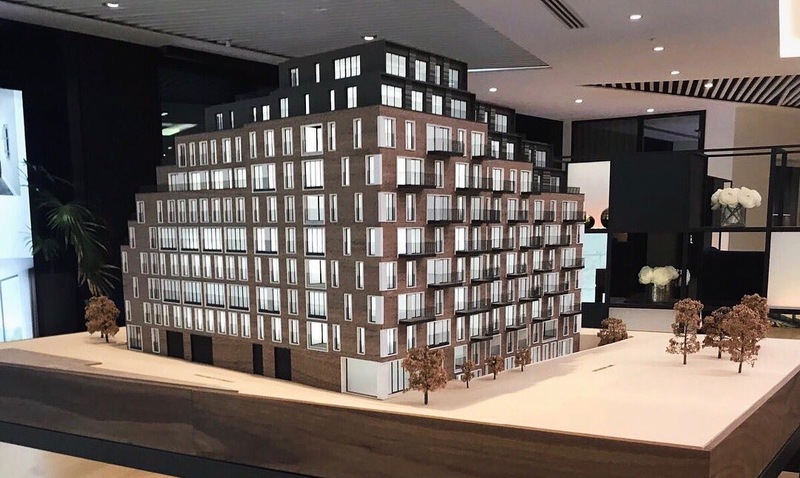 This has revealed more serious overshadowing than had been reported to the Planning Committee and that windows which would not be affected had been included in the Taylor Wimpey calculations which created the misleading impression that the overshadowing effect would be less than in fact it will be. The planners ignored the consultation objections from Prior Weston School and Friends of Fortune Park which informed them that the facilities were heavily used at the times when the afternoon overshadowing would be worst. Instead the City only considered the earlier periods when it decided the effect would be “minor adverse”. Our solicitor has also had yet another hand delivered threatening letter from Taylor Wimpey’ solicitors, Dentons, telling us that our complaints are “totally without merit”, that we will face legal costs penalties and that Taylor Wimpey refuse to agree not to demolish Bernard Morgan House before our complaints are decided by the Court. However we refuse to be brow beaten by expensive City lawyers. We have invited the planners, once again, to agree to nullify Taylor Wimpey’s planning permission before even greater public expense is incurred. We are now awaiting the City and Taylor Wimpey’s formal response to our Court application. If the Court grant us permission this could be a long and expensive battle and we need all the financial support possible to protect our community from this gross, venal and unnecessary block of luxury flats. We are so grateful for the donations we have received - we have nearly reached our target. 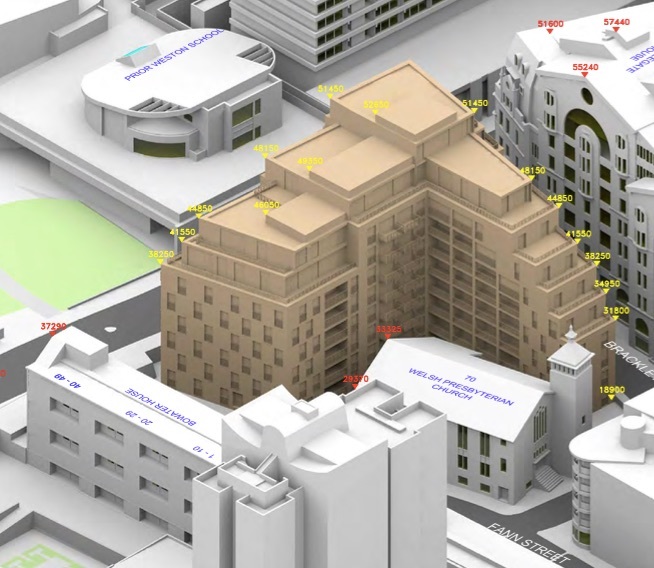 OPEN (Golden Lane) has issued a claim in the High Court seeking permission to judicially review the City's grant of planning permission for The Denizen. If we don't initially get permission we hope we can raise enough donations to re-apply at a Court hearing when a barrister will argue our case. Please let everyone know that we are depending on people's donations to make this possible. Huge thanks are also due to the artists and helpers who have mounted the Bowater House banner protest exhibition. It has really helped raise public awareness of the issues. 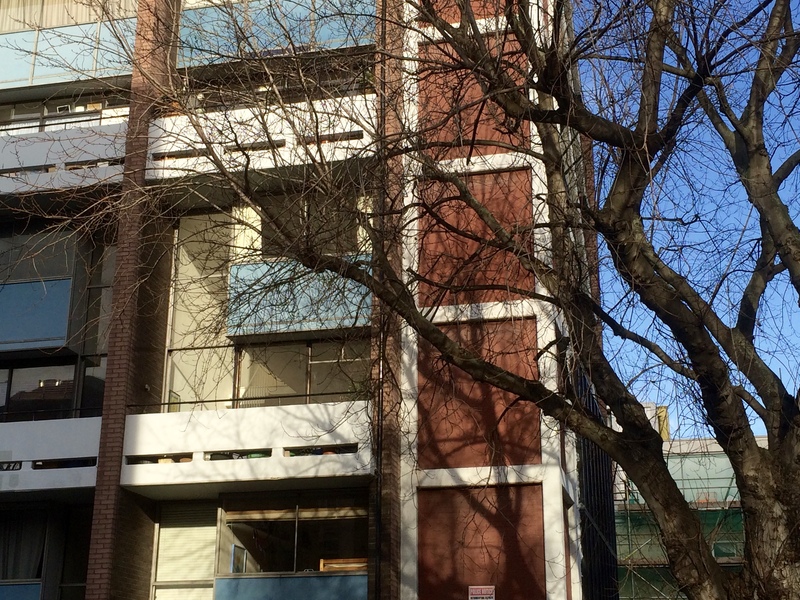 Nearly everyone in Bowater House now had a protest banner hanging from their balconies. 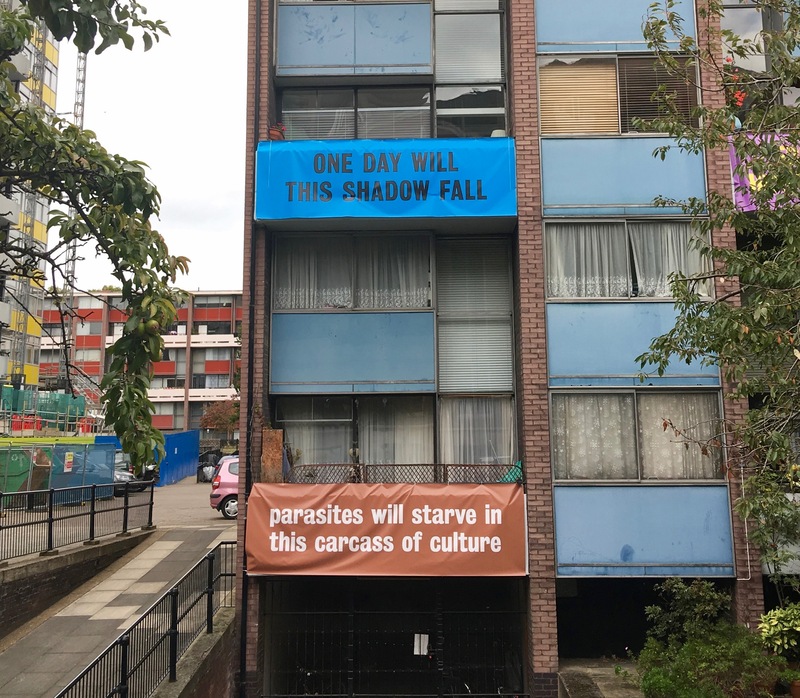 This protest brings some expressive poetry to a horrendous situation and gives a voice to the local people who have been ignored and insulted by the developers and the City of London Planning Committee. Many thanks for your continuing support to stop the Denizen. The City of London and Taylor Wimpey’s solicitors have now replied to our Pre-Action Protocol letter rejecting our criticisms of the planning permission granted to Taylor Wimpey to demolish Bernard Morgan House and build The Denizen on the site. The City has refused to agree that the planning permission should be quashed. It has disclosed to us only some of the documents which our solicitors requested be produced. The funding situation is now very urgent because any Court action to challenge the planning permission must be commenced no later than 10th October. We now urgently need estimated funds of £3,000 for our lawyers to consider the letters and documents received. If the City's justifications do not adequately address our criticisms, a further estimated sum of £3,000 is needed to settle a claim and apply to the Court for permission to proceed with a judicial review of the planning decision. We believe we have a strong case. This was a flawed decision and we have to continue the battle to protect our special community. The Planners have said that the public benefits outweigh the losses which our community will suffer but these public benefits have not been explained. We have seen only public detriment. The brochure Taylor Wimpey have produced to market the Denizen shows that this building was never intended to provide the ‘much needed homes’ they promised. Maybe if they hadn’t included private cinemas and marble floors in the building they could have afforded a bigger contribution towards affordable homes. 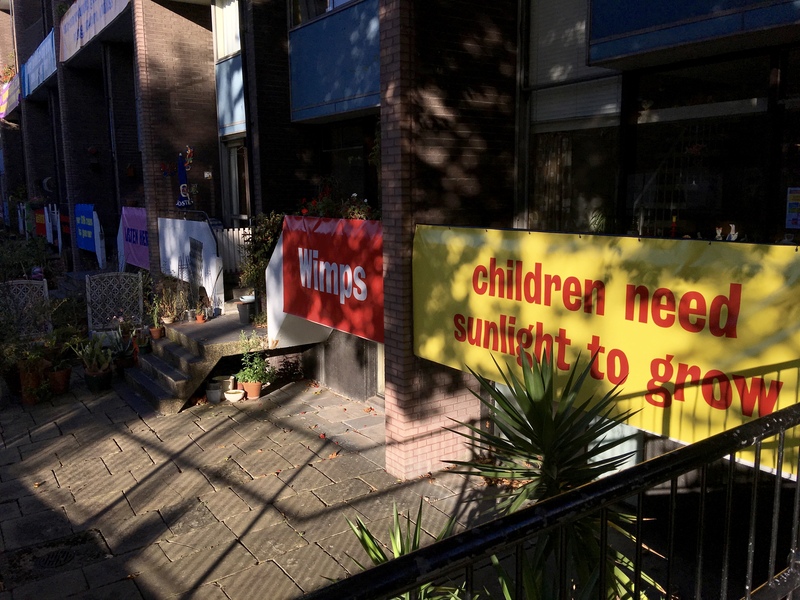 Bowater House Residents have started a banner protest. Some residents have been here since 1957 and no one understands how the City has given this building planning permission, a building which will block up to 70% of sunlight to some of their homes. Parents of children in Prior Weston School can’t understand why the City has given permission for a building which will block sunshine on its playground and outdoor classrooms. Everyone who uses Fortune Street Park can’t understand why the City is allowing a building to be built which will block afternoon sun on the park from September to March. Please continue your generous support of this campaign. After a decade of austerity this building is morally, politically and aesthetically offensive. This building should never have been given planning approval and must not be allowed to be built. To read more about the marketing of The Denizen follow this link to Knight Frank's Hong Kong Denizen Brochure. 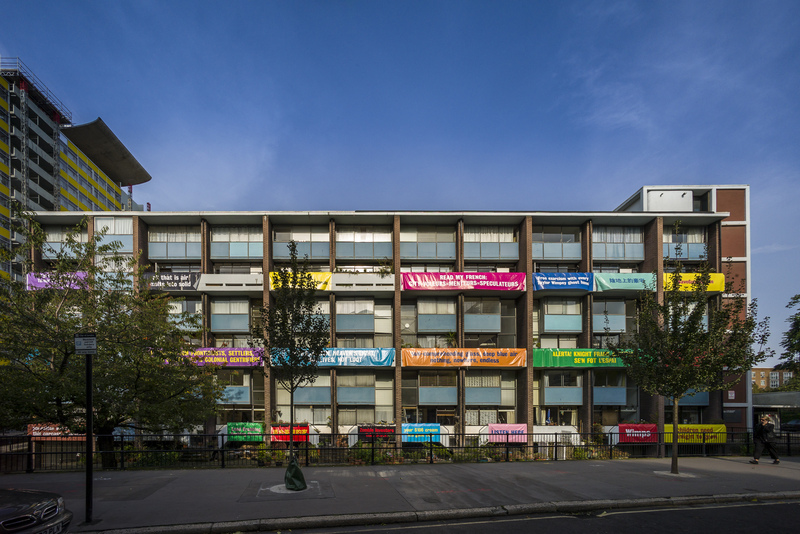 Spectres of Modernism is an installation of protest art banners emblazoned with slogans dreamt up by leading artists and writers. Thank you so much for all the support you have given this campaign. 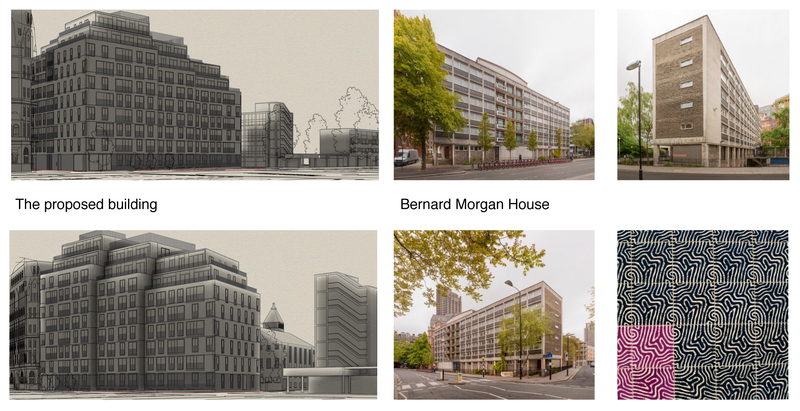 But despite numerous well argued objections the City has now, on 30 August, granted planning permission to Taylor Wimpey’s to demolish Bernard Morgan House and build its monstrous development called the Denizen. The developer must satisfy various planning conditions before commencing work. The Denizen is the name Taylor Wimpey have decided to call the new building. It’s being marketed in Hong Kong as an investment or a hotel for the super rich. Asking prices range from £695,000 for a small studio to £2,375,000. The planning permission had been subject to negotiating further terms with Taylor Wimpey for an “upward only independent review of the affordable housing contribution which the Chairman and Alderman Sir Michael Bear will be consulted on”. One outcome of that negotiation is Taylor Wimpey’s previously contribution to affordable housing has now decreased from £4.5million pounds to £4,455,000. We have received advice from Matthew Horton QC, a senior specialist barrister and our lawyers have sent a letter before action to the City requiring it to withdraw the planning permission or face an application for judicial review to the Planning Court to set it. The appendix to this letter lists the factual background and policy context, the consideration of the officer’s report and the alleged errors of law. You can read the appendix to the Pre-Action Protocol letter on the OPEN (Golden Lane) blog. If the permission is not withdrawn then we will need to raise more funds to meet the cost of the application to the Planning Court for a judicial review and for this purpose we will be starting a new campaign to Save Golden Lane and Stop the Denizen. The City of London has chosen to replace accommodation for 120 police officers and other keyworkers with these ghost homes. I hope that you will be able to donate financially to support our campaign and protect our community from such monstrous and unnecessary over development. A development which contains no affordable housing and a shockingly inadequate financial contribution to affordable housing off-site. Many thanks to everyone who has donated to the Crowd Justice campaign. We reached our target of £7000 within 30 days and we are now awaiting Counsel’s advice and a further analysis from our specialist sunlight/overshadowing consultant. The Save Golden Lane Consortium has formed a not for profit limited company called OPEN (Golden Lane). This stands for Organisation for Promotion of Environmental Needs Limited. This will help our local community fight environmental and social injustice. Because it is a company it has legal status, unlike a residents’ association or users' group, and so it can bring any necessary Court actions as well as protect individuals from personal liability. It acts as both a shield and a sword on behalf of its members. Local groups can apply to become members of OPEN Golden Lane. We have started an OPEN (Golden Lane) blog to keep everyone up to date. This is the latest post questioning why the Secretary of State rejected the request for a Call-in. Our solicitors have replied to the Secretary of State requesting that he provide reasons for not calling in Taylor Wimpey’s planning application to be determined at an independent Inquiry. We will let you know as soon as we have received the advice from Counsel about Judicial Review. Many thanks to everyone who has continued to donate. We have received an email from the Department for Communities and Local Government stating that the Secretary of State has decided not to appoint an independent Inspector to decide Taylor Wimpey's Planning Application to redevelop Bernard Morgan House. The email states "planning decisions should be made at a local level wherever possible" and it refers to Government policy which provides that the call in power is only used "very selectively", for example if planning issues "of more than local importance" are involved and which "may conflict with national policies on important matters"
This decision may come as a disappointment but not a surprise to many. This Government, like the City, does not seem to think that demolition of a heritage asset and damage to an exemplar Grade II listed social housing estate is important. Nor that blocking sunlight to community homes and local amenities is important. Nor that losing affordable accommodation for key workers, like police officers, is important. The policy to meet the need for "development and growth" appears all important, and this coincides with assuring huge profits for developers building exclusive private flats despite the damage to our local community. We are now faced with trying to persuade the City to change the decision it made on 23 May to grant Taylor Wimpey planning permission and, if that fails, to mount a Court challenge to the planning permission within 6 weeks of it being issued. Your support and financial assistance to continue this challenge is now more important then ever. Please donate to our page and stop this sunlight stealing development. Or share with anyone of your friends on Facebook or other social media. We are very close to reaching our target but we only have 5 days left. We believe the decision to Approve is unjust and we can stop this monstrous development. Many thanks to everyone who has supported our campaign and donated and shared the CrowdJustice link. The level of support shows how strongly people feel about this development and the terrible impact it will have on everyone in our community. This is a very close community. It really is an ‘urban village’ and people who live here want that to continue for generations to come. There have been many donations from people who have now moved away whose children went to Prior Weston and played in the park every day after school. We have been moved by these families’ generosity. It shows how much they valued this time in the park while their children were growing up. As one donor said: ‘Long may those memories continue to be made by others’. The Secretary of State for Communities and Local Government, in response to our request, has now suspended Taylor Wimpey's planning permission while his Department considers whether to hold an Inquiry. This means demolition of Bernard Morgan House cannot presently go ahead. If Secretary of State rules that the planning application must be decided by an Inquiry, and not by the City, then we will need legal representation at the Inquiry to oppose the application. However, if his ruling allows the Planning Committee's resolution to stand then we will have only six weeks from the actual grant of planning permission to issue a legal claim requesting the Court's permission to proceed with a judicial review. Either way, we continue to need substantial funds for legal representation to ensure the best outcome for our community. Many thanks for supporting the campaign to protect our community by stopping this monstrous development.